This is fifth lesson of WordPress tutorial for Beginners. In the fourth lesson you read about Post Creation. I have given link to fourth lesson below. If you missed that lesson you can revisit it. In this lesson we will cover Settings Option of WordPress dashboard. I am covering this option before other options because of it’s importance. This menu option helps you administer your site. Proper settings is important. So read this lesson with care. You can make changes to your site while reading this piece. The Settings main menu option is divided into several sub menus. We will discuss each one of them. This is title of your website. Remember you set this while installing WordPress. You can change this post installation as well. No need to change. These options matter if you have installed WordPress in sub directory but your URL should be different. For example if you installed WordPress in web sub directory of your web root then your site URL will be your-domain-name.com/web/. If you want to change your site URL then you can change it here and make it your-domain-name.com. Note I recommend you installing WordPress in root directory of your server. There is no need to change these settings in that case. Email address you want to receive notification. You can enter any valid email id of yours here. Membership allows visitors to create account on your site. The way you create account on Facebook or any other site. If you want to allow Membership on your site then you can check this box. Most blogs do not need membership. Also if you are not sure whether you want membership on your site then keep it unchecked. You can always check and start membership site in future. Subscriber – They can only manage their profile information. They can not create posts. Contributor – People with Contributor access can write posts but cannot publish them. Author – People with Author access can write and publish their own posts. Editor – People with Editor access can publish and manage posts of themselves and other users. Administrator – You installed WordPress so by default you are Administrator. You will have all access. Apart from above there are options like Timezone, Date format, Time format. You can use these options to set your time and date. You can set as per your Country or preference. Site Language option is used to decide language of your site. In lesson 4 we discussed this. If you do not select a category for your post it will use default category. The default category is Uncategorized. If you want to change default category you can change it here. For that you need to create a category. In case you are not sure or forgot how to create category refer lesson 3 of this tutorial. After creating a category you have to select it in this option. At the end of the page you have Save Changes button. Click on that button to save your changes. If you do not want Uncategorized category in your website you can delete it now. To delete it you have to go to Categories menu under Posts option. This defines layout your articles will use by default. You can leave it as it is for now. We will discuss about post formats in Themes lesson. Standard layout is the default one. It is the format for Blogs. By default WordPress defines below formats. But whether these formats are available or not depends on your theme. Aside – Post without title. Since it is theme specific thing we will not discuss each type here. The layout and display varies theme to theme. You can write WordPress posts via Email. This is advanced feature. We will not discuss this feature in this tutorial. Many new bloggers ask how can we inform everyone about your posts. This is one way to do so. You can copy and paste below URL’s into the text box. By default WordPress has only one entry. You can update it with below list. The default value of this option is Your Latest posts. If you browse your site now you will see list of two posts. The first one we created in previous lesson. The second one is default post created by WordPress during installation. Now if you do not want to display post list on front page of website follow below steps. Front page of website is page displayed when visitor enter only your domain name in browser address. For example front page of this site is this one and blog page is this one. Note if you want to display list of recent posts on front page then no change is required. You can keep the default value selected. Create two pages. One for Front page and one for blog page. You can name your front page as Home and blog page as Blog. This is not a rule you can name them anything. But for convenience I used above names. To create a page go to New Page option under Pages menu. You can just enter the title of page for now. After entering the title publish the page. We have seen details of this in previous chapter. The process is same for Pages as well. 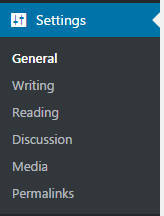 Now to go Settings – > Reading option and make sure Front Page displays looks as shown below. After saving the setting in above screen you can browse the pages in web browser. In blog page you will see list of posts. In home page you will see blanks. Now you can edit your Home page and add content as per your need. I recommend using this approach it you want to extend your site in future. For example if you are starting like blog but want to host store on it in future or course on it in future then changing front page displays is important. But if you are fully confident you will only use the site as blogging platform then you can keep Front Page displays as default value. It really depends on your taste. Many top sites show list of recent posts on home page. Some blogs show different types of posts on home page. So they are using Static page as front page. I also prefer using Static page as front page. Number of posts in syndication feeds. You can keep the default value of 10 as it is. The default value is full text. Change this setting to Summary. Summary will first couple of paragraphs (55 words) of your post instead of full article. The Discussion menu controls Comment settings for your website. We have not yet discussed Comments menu. But we will discuss it in next lessons. But that would not hinder our way in this section. Most setting on this page can be kept as they are. By default all options under this menu is enabled. If enabled first option will inform blogs you linked in your article. The second option will inform you if someone linked to your article in their posts. The third option allows people to comment on your posts. You can enable or disable first two options if you want. I prefer them being disabled. The third option is very important. Most of the cases you should not disable it. People can comment on your article . It makes your content interactive. You can create loyal reader. It will also help in search engine ranking. More on search engine ranking will be shared later. It also brings traffic. People who commented on your blog will comeback to see what you said.So I recommend enabling the third option. You can keep the defaults. By default comment author should fill up name and email before commenting.This is good for most site types or blog. There is alternative option in which visitor will have to register on site before commenting. The setting is bit restrictive. This setting is important if you want to set up community type of site. Note You can change from one setting to other any point of time. But form start you need to determine whom you will allow you to comment on the article. For example this article of mine allows every one to comment after entering their name and email. People do not want to create profiles on a site just to comment. So if you think people should create profiles like they do in some forums and sites then you can have the option Users must be registered and logged into comment enabled. I prefer to keep this option disabled. It is enabled by default. You will receive email notification when someone comments or comment is held for moderation. Moderation means you have the option to approve or delete the comment. If you approve the comment then it will show on your article. If you do not then it will not show on your article.If you have decent number of comments then this setting may irritate you. I prefer logging into Dashboard to get idea of new comments. The default value is Comment author must have previously approved comment. So if someone has a comment approved then he can SPAM you with later comments. Normally SPAMMERS do not have patience they make garbage comments from first comment. This option works fine. But I prefer using more restrictive one. You can use comment must be manually approved. With this one enabled you have to approve every comment before they are shown on your article. Always use one of these options enabled. There are good amount of bad people who just want to put garbage content in form of comments on your site. So you must have this option enabled. Leave these options as they are. We will use plugins to stop SPAM. So no need to worry about these two options. In Comment Moderation and comment blacklist you can add words. If a comment contains one of these words then they will not be approved. I prefer to keep it blanks.As mentioned above plugins will help keep unwanted comments out of your site. Avatars is small image associated with your Email Address. If you comment on a site with Avatar enabled Image associated with your Email address will be displayed. The image for your Email is created on Gravatar site.You should create Gravatar account using Email address you used to create you website. You will need WordPress.com account for this. In first lesson we discussed creating WordPress.com account. Now you can leverage that account information to create your Avatar.If you have not yet created WordPress.com account then follow steps mentioned in below lesson. Avatars will help people recognize you. You should use the Gravatar email to comment on different blogs. People will know you and it helps in building relationships. Also on your own blog if you comment then people will see your Gravatar image. Enable this option to show Avatar of commentators (people making comments on your site). I have this option disabled to speed up my site. We will see this in speeding up WordPress tutorial. You can set this value as per your blog requirement. For most blogs who are planning to use Google Adsense use G (suitable for all audiences). I recommend using G on most sites. You can use any other option if you have some strong reason. It may be the case that your commentator does not have Gravatar account. Then there will not be any image associated with commentator email. Default avatar option helps you select default image to be shown for those commentators. The default options works well for most sites. WordPress creates different Image sizes for images uploaded to it. The three sizes and their dimensions are mentioned on this page. 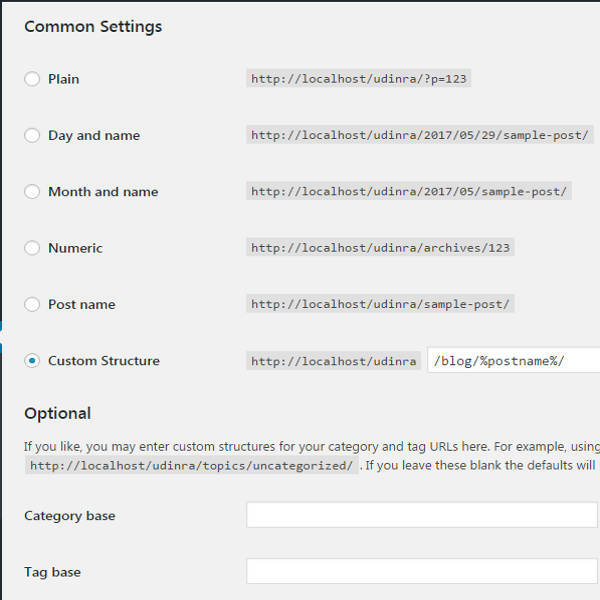 This option defines organization of files you upload on WordPress. You can upload Images, Videos and Audios or other files.By default these files are uploaded into month and year based folder inside wp-content/uploads folder. If you do not want to organize your images in that format you can disable this option. Other than organization this options has no impact. This is very important setting. You should get it right from day one. Every post/page on your website has an address (URL). The URL of page or post is determined by this option. In previous lesson we saw permalink option while creating a new post. That permalink is determined by option we choose in Permalink menu. You should first set permalink menu before publishing a post. Changing permalink after post is published will change URL of the post. So you will have same post on two different URL. This is not good for Search Engine ranking. So please read this section with case and formalize your permalink once for all. WordPress provides some default options . You can select any one of default options or you can use custom structure as shown above. The second option helps you get additional keyword in URL which is good for SEO.But it requires careful selection of Category for your posts. Third option will have author name in URL.This can be used on multi author blogs. 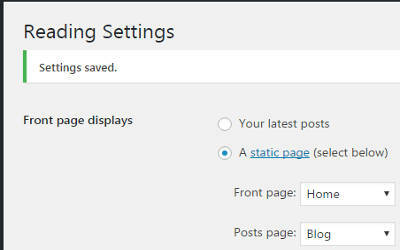 Note you can segregate posts in WordPress admin area based on authors. But in case you want to differentiate on front end as well you can use this option. After making changes as per your requirement do not forget to Save the options. With this we covered every option under the Settings menu of Dashboard. In the next lesson we will cover Media , Users , Comments and Tools option. As these are small topics. In next lessons we will dive into detailed topics of Themes and Plugins.